Validately Insights - Save days worth of work preparing research reports! All of your notes and video clips are organized in one place to help you easily analyze your research data and make clear recommendations for stakeholders. Stop re-watching hours of video and using incompatible platforms to store all of your research data. 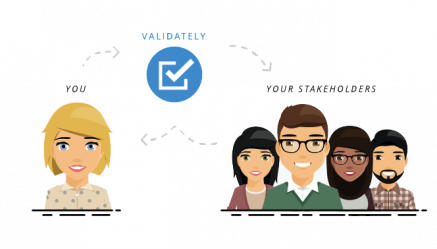 With Validately, everything involved with research is in one place and easy to find. Save time... a lot of time! Validately Insights uses hashtags to organize all of your notes and video clips related to specific topics across every session in your research study. Easily synthesize your results by adding comments, images, quotes, and key takeaways with video evidence and feedback from real users. Share your Insights Report with stakeholders with one URL. No need to download or export files, manage cloud drives, or constantly fuss with shared documents. Insights Reports automatically update for stakeholders when edited or new data is added. Use one document to share findings and results for an entire research study. Analyze data from moderated and unmoderated research studies. Test any web-based prototype (InVision, Axure, etc.) on desktop and mobile. Conduct moderated native app tests on iOS and Android. Invite observers and note takers to sit in on live research sessions.